Tim Boyle / Getty ImagesCostco is known for its great benefits and high pay. Costco is unconcerned about losing potential employees to Amazon despite the e-commerce giant’s higher minimum wage. CFO Richard Galanti said that Costco’s average pay still “dwarfs any other retail or retail-type entity out there” in a call with investors on Thursday. 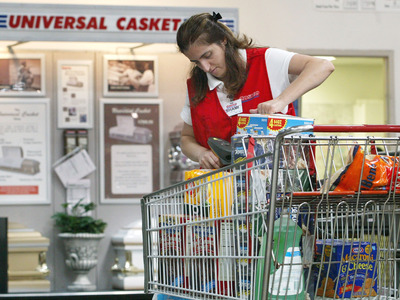 According to Galanti, Costco workers make an average of roughly $US22.50 per hour, with employees who have been at the retailer for years making into the mid-$US40 to $US50 range. On Tuesday, Amazon announced plans to raise minimum wage to $US15 per hour, following Costco raising its minimum wage to $US14 earlier this year. Costco’s executives are confident the retailer is still on top when it comes to workers’ pay and benefits – even after Amazon’s much publicized wage increases. “Our average US hourly wage is in the mid-22s, $US22.50 roughly, which we believe dwarfs any other retail or retail-type entity out there on a big scale,” Costco’s CFO Richard Galanti said on a call with investors on Thursday. In June, Costco announced it was raising the minimum wage from $US13 to $US14. Galanti also emphasised that the retailer offers significant raises to employees every year, something many retail rivals do not do. “An employee who has been here over a number of years can get up into the equivalent of mid-$US40s to the mid-$US50s on an hourly basis over time, as well as great health benefits,” Galanti said, in response to a question about Amazon’s wage hikes and attracting talent. On Tuesday, Amazon announced plans to raise the company’s minimum wage in the US to $US15 per hour. The company also said it will work to gain Congressional support to increase the federal minimum wage. Amazon’s announcement follows months of high-profile criticism of the company’s treatment of workers. In September, Sen. Bernie Sanders introduced the Stop Bad Employers by Zeroing Out Subsidies (BEZOS) Act. The bill, a clear reference to Amazon founder and CEO Jeff Bezos, would create a welfare tax for large employers with workers who receive federal benefits such as food stamps. The company regularly finds itself on Glassdoor’s list of best places to work. Costco workers who spoke with Business Insider earlier this year raved about the benefits and compensation. “The best part is all the perks – guaranteed hours, benefits, time and a half on Sundays, free turkeys at Thanksgiving, four free memberships, a livable wage,” one employee with six years of experience said. There were 757,000 retail-job openings across the United States in July, which is about 100,000 more than a year ago, The Wall Street Journal reported, citing the Bureau of Labour Statistics. The influx of jobs is coming at a time when unemployment is low, at 3.9% in August.